Front of the Document. 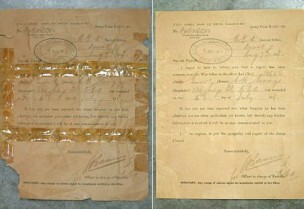 Before Treatment: Document shows overall discoloration and presence of pressure sensitive tape and the stains associated with it. Also visible are edge tears and losses of paper support. After Treatment: Document after dry surface cleaning. 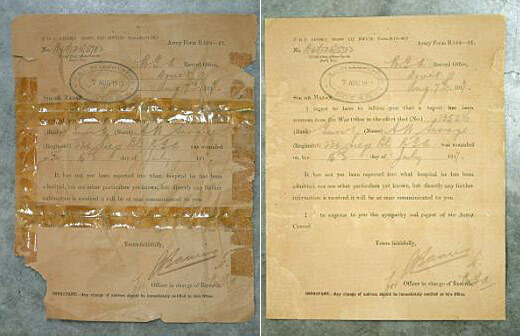 The adhesive tape and stains were removed using solvents and aqueous treatment was carried out. The document was then lined to a light-weight paper to provide overall support. Back of the Document. 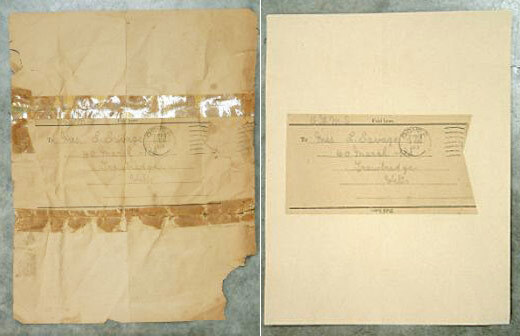 Before Treatment: Address and postal markings are visible. More adhesive tape and staining. 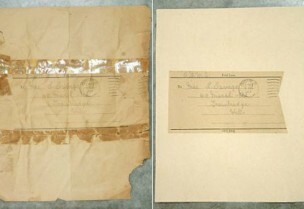 After Treatment: Document showing the lining paper with a window area cut out to allow the inscriptions to be viewed.